My Korona 8×20 camera is heavy but it is still possible to hand carry it by the leather handle for short walking distance. Carrying it bare will expose it to scratches and knocks as it is easy to bump this big camera into walls and such. So I went to buy a $5 foam camping mat, some Velcro straps with tape and went off to work on a DIY protective case. As seen in the video, I have the map trimmed to the required size including the corners and then add in the Velcro straps at the places where the different ends meet. The Velcro straps came with tape where I simply taped it to the foam. It may not last so I have sew a few of them in place instead. The foam is not to the best material to sew but I will monitor and see how well they stand up to the frequent opening and closing. While this is for a ULF camera, it can be easily modified for a smaller camera. 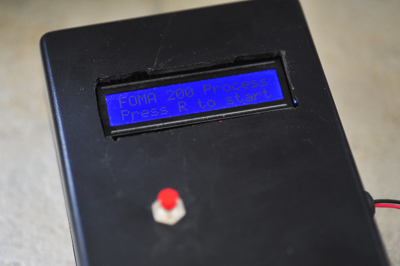 In my previous post about the DIY Rotary Film Processor that I use to process my 8×20 film for my 8×20 camera, I did not go into details about the Arduino code that controls the rotation and timings. 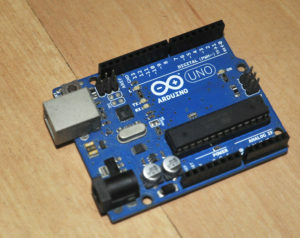 This post will explain more about the Arduino portion. I am not a programmer so what I did was to piece the different sample codes for the different shields in order to achieve what I need. This is a Rotary Film Processing controller . It simply rotates a motor for 4.5 seconds in one direction before rotating back in the reverse direction for another 4.5 seconds and stop for a sec. This is considered as one cycle. Therefore 6 cycles of it will constitute 1 min. Currently, it is coded for my FOMA 200 developing needs. You will probably need to modify the code to your needs. * . This is considered as one cycle. Therefore 6 cycles of it will constitute 1 min. This Rotary Film Processor project has been on the back on my mind for ages but it became a priority after I got a 8×20 camera. I managed to get a paper drum that can take up to 16×20. Usually I process one sheet (which for now is actually 2 pieces of 8×10 joined at the shorter side) at a time. Handrolling the tank for 15 mins for every single 8×20 shot is no joke. In terms of design, I have been looking at the various DIY designs that are found online. Of all, this youtube video looks the most interesting. However I decided to modify the design not to use a water tank for a few reasons. I do not need a water bath to regulate the temperature. I am quite happy with developing at room temperature. Even when I develop at 20C, I am fine that the chemicals go up by a degree or two. Saving of water since I do not need a water tank. The buoyancy of the water aids the rotation of the tank but I can replace it with a roller base. A more compact design and easier to store away. 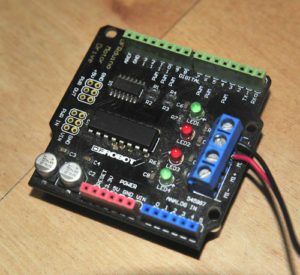 I have been doing DIY projects for a while so I have collected quite a number of parts so I am able to start the project using mostly of what I already have. Therefore pardon me for the non standardization of lengths and measurements. This is similar to the Jobo roller base. 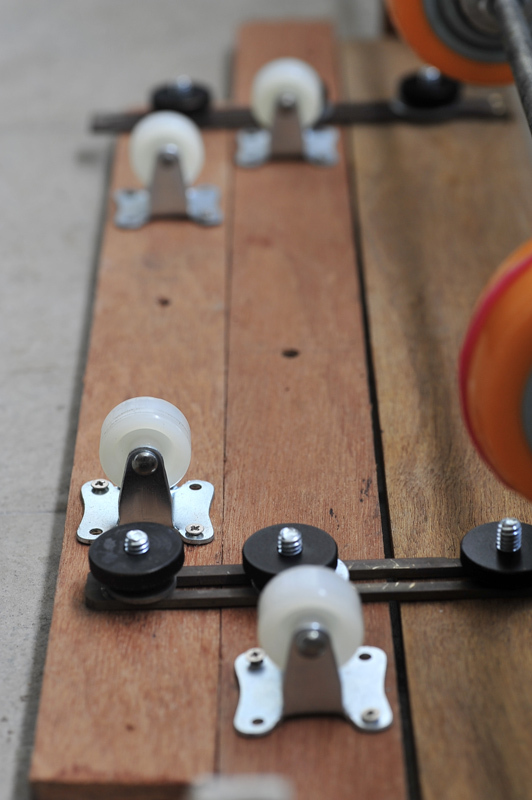 To make this, mount 4 pcs of 1″ Rigid wheels on 2 pieces of plywood. The length of the plywood will depend on the length of your drum. Using my wood scraps, I have a 24″ and a 17″ pieces. Space out the wheels so that the drum will be well supported. Of course you may add more wheels if you intend to process drums of different sizes. I connected the 2 pieces of plywood using 2 brass rails (they were from a forsaken camera project). 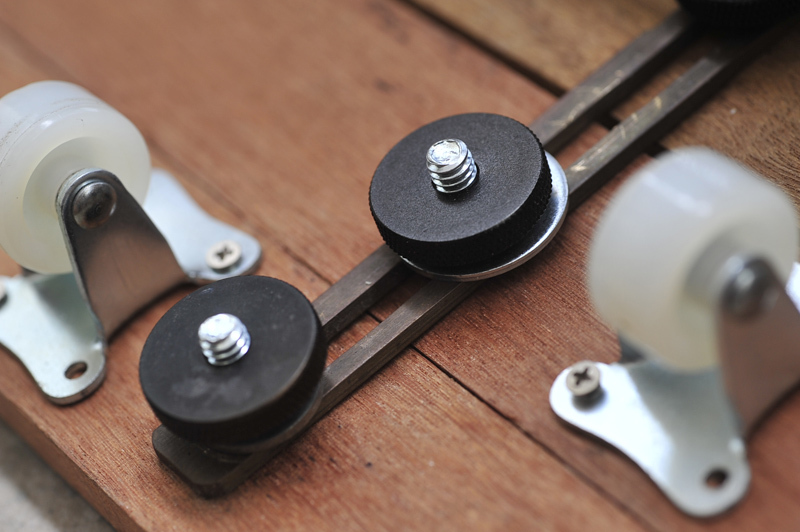 They are locked down using 1/4″ bolts and nuts. 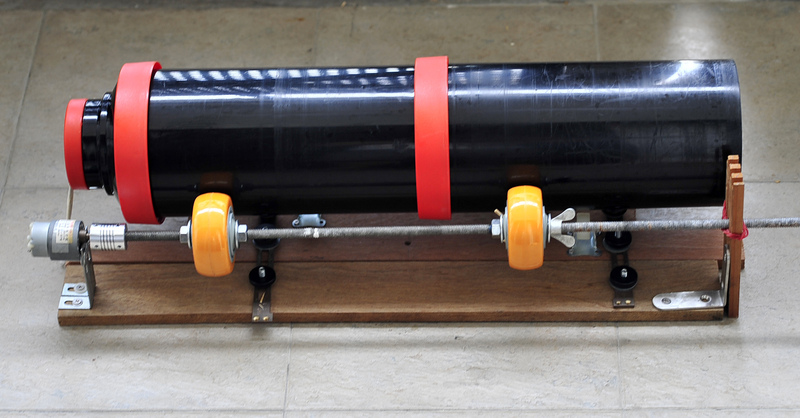 This will allow me to adjust the distance between the 2 rolls of wheels for catering to drums of different diameters. At this point the drum should rotate smoothly and evenly by hand. For now I am using a 12V 30 rpm motor. 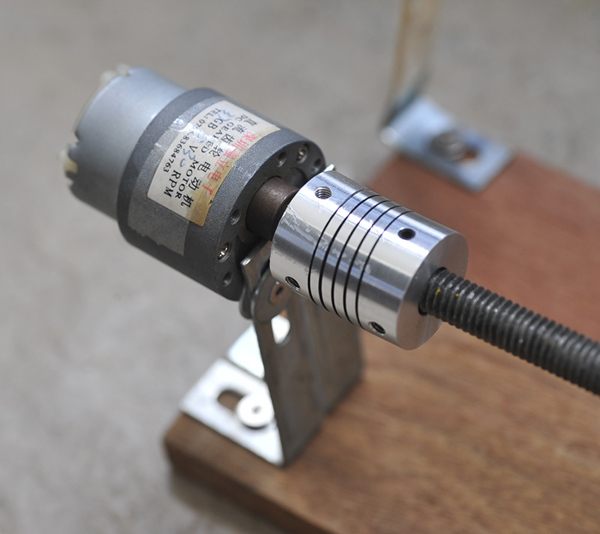 To mount the 3/8″ threaded rod (again another piece I have sitting around) , I use a flexible shaft coupler which has a one 6mm hole what will fit the motor shaft while the other end is a 10mm hole that fit the 3/8″ rod. The 3″ wheels were purchased new as the old inline skate wheels I salvaged from my old skates have a bearing hole of 7mm. The hole diameter need to be 10mm for the 3/8″ rod to go through. They were then tighten with nuts on both sides. I placed a drop of Locktite so that the nuts won’t get loose from the turning . 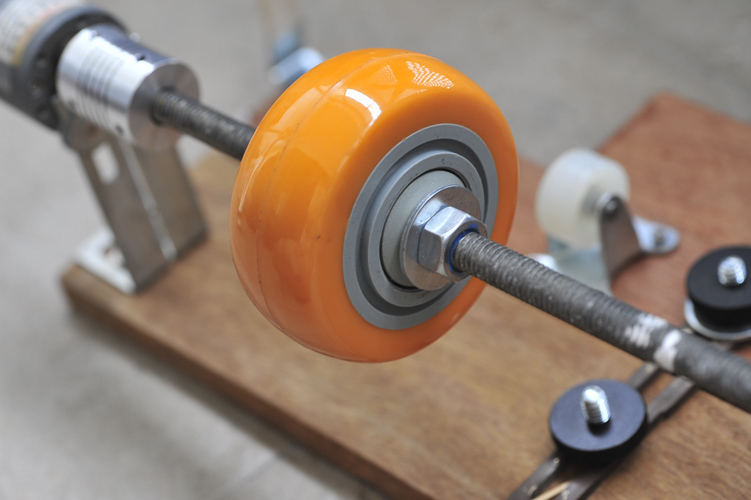 However as we do not want the wheels to be free spinning as the rod rotates, I have to jam the ball bearings. In this way, the wheel will turn with the rod and then in turn causes the drum to rotate. 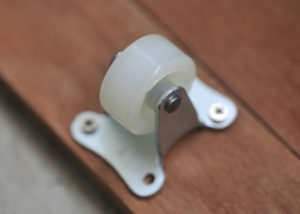 Wheels with 2 nuts locking it down on both sides. I have an Arduino Uno that was for my Kallitype printing which I modified it for this rotary film processor project. Basically with a motor shield and LCD shield, the sketch will go through the following cycles where the timings are customised for FOMA PAN 200 film using HC110 Dilution D.
I hope this article give a good picture on how to construct a rotary film processing on your own. There are still quite a few improvements to be made for mine. 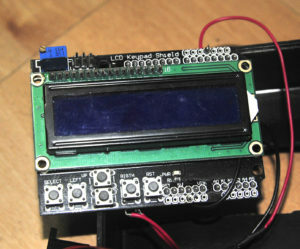 You will need to customize it to your own needs and also the ability to source your parts at your side.